HO4 insurance, or renters insurance, is financial coverage for 1) damages or losses to your stuff 2) legal fees if you’re sued 3) other’s medical bills if you’re at fault and 4) temp living expenses if your place becomes uninhabitable. Score! HO4 is essentially a financial safety net for you and your stuff. Along with loss or damage due to theft, fire, vandalism, some types of water losses like burst pipes, and other bad things, it also covers temporary living expenses and certain medical or legal fees. And by coverage we mean financial help. You pay a monthly premium to your insurer in exchange for the ability to be reimbursed when something bad happens. Keep in mind, though, there are specific things your insurer will and won’t cover you for… we’ll break down all of that in the following sections. How does an HO4 policy work? When you sign up for an HO4 policy, you sign up for future protection in the event something bad happens to you, your stuff, or by you to others (accidentally, of course!). Note: The insurancey names for the above (in order) are: personal property coverage, personal liability coverage, medical payments to others, and loss of use. Once something happens that’s covered by your policy, you can submit a claim to your insurer. If the claim is approved, you’ll receive a reimbursement, minus your insurance deductible, of course. Good news? There’s a solution to financially guard yourself against these types of things: renters insurance! In exchange for a monthly premium, you get protection for a huge range of things that matter to you in your life. Personal property is just a fancy way of saying “your stuff.” In insurance, it’s known as ‘Coverage C‘ and includes things like your phone, laptop, TV, furniture, clothes, you get it. So say your neighbor has a leaky sink and the water dripped down into your apartment ruining everything in your living room. You’d be covered! Just to note, you may have to get a bit of extra coverage for things of value like jewelry, electronics, cameras, etc. Why’s that? Well, there are sometimes limits on these types of things. What you’ll have to do is ask for these items to be scheduled – it’s super easy to do and doesn’t cost too much. Electric goes out in your building. It’s winter. Your landlord is on vacation and you cannot get ahold of them. Now what? So, say you usually prepare food at home and have to eat out, or have a washing machine and dryer and suddenly have to send your laundry to a dry cleaner – those would be prime examples of things covered under your policy. Most people don’t know this, but HO4 insurance also covers legal fees and medical expenses. In the above cases, your personal liability insurance will kick in and cover the cost of a lawyer to defend you, and pay the damages that you’re responsible for. How much is HO4 insurance? The price of your insurance policy depends on a bunch of different factors, such as your apartment’s location, the condition of the building, your personal history, and the amount of coverage you need. Traditionally, the cost of your insurance policy will also include factors like the risk of fraud, or the overhead costs to pay for hundreds of brokers to give out policy prices. But nowadays, several insurance companies, are using tech – namely, replacing brokers with bots – to dramatically lower insurance premiums to as little as $5 per month. TL;DR? Your policy price depends on your apartment, how much coverage you get, and which insurance company you use. Traditionally, to get HO4 insurance, you’d have to go to an insurance brokers office, sit down, answer a bunch of questions, and they’d get back to you a week later with a quote. Then you’d do that again and again until you found the right mix of value for money (i.e. the best coverage for the best cost). 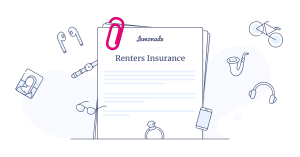 More recently, getting renters insurance is a breeze. Most companies offer a super streamlined quote process entirely online. While you still have to answer a bunch of questions, most will offer you a quote on the spot and it’s pretty easy to shop around for the best value. Today there are insurance companies serving up policies on demand. They’re doing this by using a mix of artificial intelligence, natural language processing, and other technologies. Read: If you need an HO4 policy today, you can simply download an app, enter some info, get a quote, and purchase a policy in less than 90 seconds.